It can difficult to keep track of a new employee’s important information, especially if you’re hiring for the busy seasons at the end of the year. 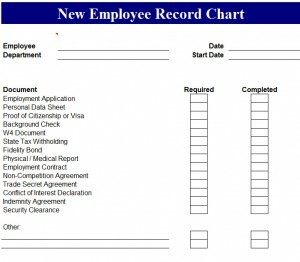 Well don’t fret, because the New Employee Record Chart has you covered! This easy-to-read document is formatted as a checklist, so you can quickly mark off all the information you’ve covered and move confidently on to the next task. Simply download the file below and select an easily accessible location on your computer. Click on the file to open the template. With the file open, you can see how simple the record chart will make keeping track of your entire employee’s work information. By clicking on any of the text and writing your new information, you can easily customize this template to fit your specific needs. This is the perfect tool for any business, small or large, and non-profit organizations to keep track of all the important documents and information associated with your new employee. The Employee Record Chart is formatted as a simple checklist, so you can quickly and efficiently mark off the information that has been covered, regarding your new hire. Now you don’t need to worry if your employee was passed for security clearance or has their W4 information filled out and filed. This template takes out all the hard work, so you have the freedom to finish your day. There are many elements to hiring a new employee, and making sure you have all the bases covered is one of the most important aspects to hiring on a new employee. You need to ensure that they have passed the various security checks and have submitted their tax information, missing any of these could be disastrous, and consume even more of your time. Avoid the worry and panic by downloading this simple and free record checklist.